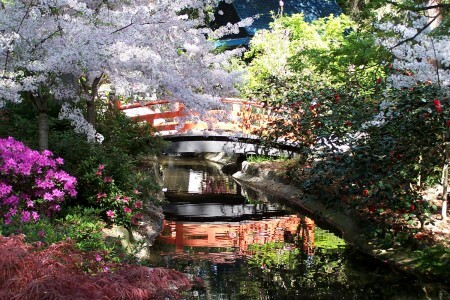 For some 50 years, the Japanese Garden has been a favorite destination of Descanso Gardens visitors. Measuring a generous acre, this green-space feels almost like a world unto itself. Tucked beneath the shade of coast live oaks, the Japanese Garden includes many plants that originated in Asia, including camellias, black pines, mondo grass, flowering cherry trees and Japanese maples. The peace of the garden is punctuated by the sounds of birds, water burbling in the stream and the rustle of leaves in the breeze. The garden includes features found in many different styles of gardens in Japan, including the stroll garden, the stream-and-pond garden, the tea garden, and the raked-gravel garden (karesansui), often called (incorrectly) a Zen garden. The Japanese Garden opened in 1966, culminating years of work by a dedicated group of volunteers, including Mrs. Forrest Kresser “Judge” Smith, founding president of the Descanso Gardens Guild, and guild board member Frank Kuwahara. The general manager of the Southern California Flower Market, Kuwahara engaged the support of the Japanese American community in the project. The garden was designed by noted landscape architect Eijiro Nunokawa of Los Angeles, while the teahouse was designed by architect Whitney R. Smith of San Marino. The teahouse was operated by Pasadena restaurateur Robert Kawashima with his sister, Mary Matsumoto. Kawashima also funded construction of a gift shop built to emulate a minka, or Japanese farmhouse, which was designed by architect Kenneth Masao Nishimoto. The garden also was expanded to include the now-iconic red bridge which spans the stream. The teahouse and the minka served as the Descanso Gardens food concession and gift shop for 15 years until the Courtyard complex was built in 1982. Perhaps as important as plants and physical features of Descanso’s Japanese Garden has been its role in bringing people of many cultures together in an extended conversation about what it means to be part of a multi-cultural community such as the one that has evolved in Los Angeles. The story of Japanese and Japanese American people in Southern California is an important strand in our collective history. Join our celebration of the Japanese Garden’s 50th anniversary at the Japanese Garden Festival, Oct. 15 and 16. And be sure to see “Sharing Culture | Creating Community,” an exhibition charting the history of the garden, in the Sturt Haaga Gallery Oct. 15, 2016 to Jan. 29, 2017.